A museum quality reproduction Type D oxygen mask produced by Steve Silburn. Superb attention to detail with accurate cloth and a chamois lining interfaced with calico, a stiffener and rod solder above the 'nose'. The microphone mounting ring is stamped with the stores reference number 6D/117 and has a sprung loaded brass hinge at the bottom to accomodate all microphone variants for the mask. A sprung loaded retaining pin at the top secures the microphone (when fitted). 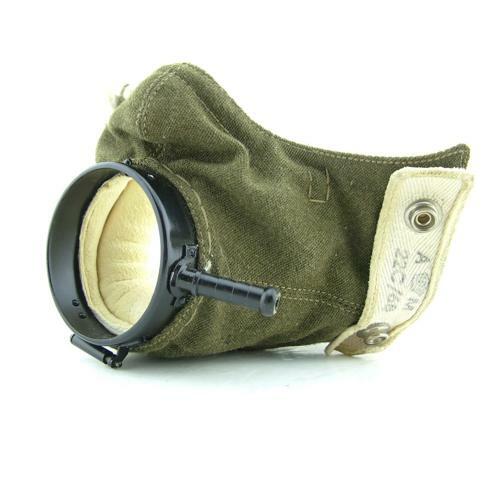 This example has also been fitted with a pair of reproduction 'face protectors' in order to secure the mask to a Type B helmet. This is the same as those masks supplied to The RAF museum, Imperial War Musuem Duxford and for the recent film 'Dunkirk'. In excellent used condition with lightly soiled chamois giving that authentic look. These masks are a fraction of the cost of an original. Stock code O22981.